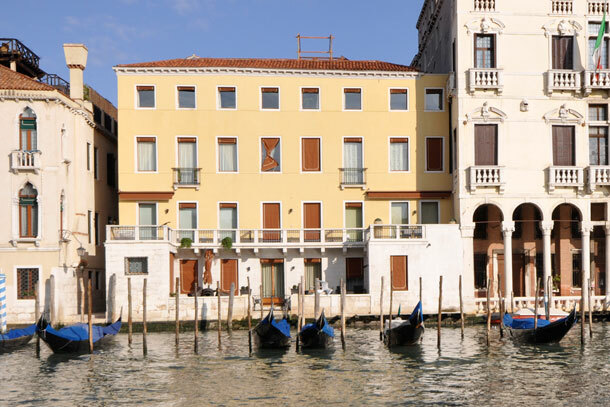 This modern and elegant apartment is situated in a noble Palace that has been recently renovated, which directly overlooks the spectacular Grand Canal. Access to the Palace through a small, delightful `campo`, just a short walk from the Santa Sofia ferryboat stop, where you will find a Gondola that goes back and forth to the Rialto Market for just a few cents. The apartment is situated in the Cannaregio district, near the Church of SS Apostoli, which you an easily walk to, very near to the Rialto Bridge with its colourful fruit and vegetable market, St. Mark Square with its extraordinary beauty, and the Church of Miracoli. Portion of a splendid, equipped terrace of exclusive use of the guests and which directly overlooks the water, offers a charming view of Canal Grande and is an ideal location for enjoying the view of the most beautiful historic Venetian palaces and for organizing unforgettable candlelight dinners. GROUND FLOOR: entrance, living/dining-room with TV and with kitchen area with dishwasher, oven, freezer, access to the equipped terrace (the middle area which is the most spacious is of exclusive use and the side areas belong to the adjacent apartments), 1 double bedroom, separated from the entrance by a sliding door and a dark curtain, 1 bathroom with shower. The apartment has air conditioning and autonomous heating.